I just wrote a response to a question on an ME forum about sick notes – but thought as it had my entire knowledge of sick notes I’d post it here too! I’ve even added some additional bits. My employer (and I think it’s a statutory thing so everyone is the same – but don’t quote me) allows you to “self certificate” for the first 8 days of sickness. This includes weekend days during that period of sickness. After this time if you are still ill you require a sick note from your GP. On the back of the note you need to complete some details (name, address, national insurance number, works/employee number if applicable). You can continue to have sick notes issued by your doctor for as long as your doctor agrees you should refrain from work. So in that sense you just keep asking for a new sick note when the current one runs out. Your GP can’t put a future date on the sick note, but they can give you a backdated sick note. Make sure the sick notes cover you continously to avoid problems further down the line. If you can keep a copy of the note before you send it to your employer/benefits office (I use a scanner and keep copies of my electronically on my computer as photocopy is not practical for me!). If there is a gap in the sick notes (between the end of the last one and the start of the new one) contact your GP surgery and explain you need a note that covers the gap. Often GP’s are usually happy to write sick notes without seeing you where the condition is “long term”. Ring your surgery and ask about getting a repeat without an appointment (unless of course there’s things you want to discuss at the same time). Some doctors may insist on seeing you. As we know not all doctors are sympathetic about ME/CFS – if you have problems getting a note I can only think to try and see another doctor. My GP surgery will also let you request a phone call from a doctor where you can have a quick discussion (ie. “there’s no change doc”) and they’ll look at your records and do the note for you there and then. I started off with a 2 week note I think and then the GP suggested going for a month, then 2 months. If you realistically and honestly think it will be a while before you are well enough to work again then it makes it easier for your employer to plan knowing it’s going to be a bit more than 2 weeks. Plus if you feel better before the note is up you can see/speak to your GP and they will do you a return to work note which cancels it out. Sometimes a doctor will write an open note and sometimes they write the date you can return to work. If it’s an open note (eg. refrain from work for 2 weeks) then you must get a return to work note before you go back to work. If you’re not sure if you need one or not ring your surgery and ask. A GP can write a note for a few days or for many months. I am currently having 3 month notes as I find it a useful excuse/reminder to see my GP every 3 months and have a little review of where things are at. 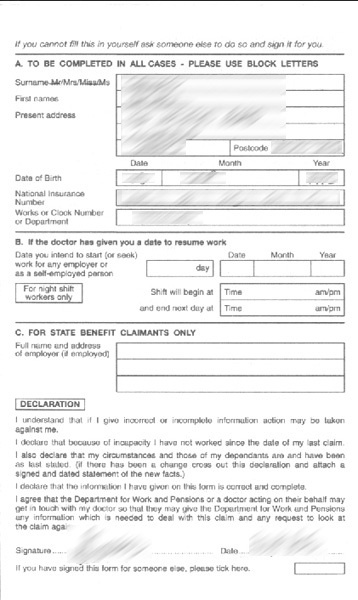 You will need to send the original sick note to your employer, until such time as they stop paying you and you have to make a benefits claim – in which case you need to send a copy to your employer and the original goes to the benefits people (I haven’t made a benefits claim yet so I don’t know about that bit). Hopefully it won’t come to that! As for how long you can continue to be off work sick with a doctors note before losing money and so forth this varies from employer to employer. Some will continue to pay full wages for many months while you are off sick. This is what they call an “occupational sick pay” scheme. Your employer voluntarily pays your full wages. My employer gives 6 months full pay, then 6 months half pay , before going to nothing (and leaving me needing to claim benefits). They are public sector and it’s a good deal. Part of my sick pay has been made up with Statutory Sick Pay but it all gets a bit complicated so don’task me to explain! Other employers are not as good as mine! They will only pay Statutory Sick Pay so you will see a change in your income/wages almost immediately. Statutory Sick Pay (SSP) isn’t a lot (£72.55 as I type) – but it’s better than nothing! SSP is paid by your employer for up to 28 weeks. You’ll need to check your employers policy to see what they offer – give your HR people a ring or email if you’re unsure. There may also be rules about eligibility for Occupational Sick Pay (like how long you have worked there etc). There’s also rules about eligibility for SSP. Sick pay makes my head spin – but this blog post is about sick notes after all! I hope some of this is useful to others. So far I’ve had 18 months of experience with sick notes and signing back on to work and off again! It can be quite daunting when first have to deal with it. Finally here’s what a sick note looks like – with some blurring to protect the innocent. It’s not that exciting – they could use a nice colourful border to cheer us sickies up. And, yes, I know my sick note says “Post Viral Fatigue” but lets leave that for another blog post and think calm thoughts. This post was originally written in Sep 2007. I’m not an expert. I am no longer up to date with the provision of sick notes or sick pay. Ring your GP surgery for advice on how to get a sick note. If you need further advice on sick notes, sick pay or employment issues I recommend you contact your union (if you are a member) and/or contacting your local Citizen’s Advice Bureau. i have provided sick notes constantly,because i keep get 2 weeks from my doctor..
last month i got paid my full wages,but this month i got not even a quater..
i spoke to some of my collegues and they told me i should be getting my full wages for 6 up to 6 months,is this right..
im so annoyed,and also very un-sure !!!!! Hi wef. Well I’m not an expert of course! But it sounds like you need to find out from your Human Resources (HR) or Personnel Department what their policy is. (Mine had a copy on their web site and I also got information by emailing them with my questions). If you earn more than £90 a week (before tax and deducations) you will be entitled to Statutory Sick Pay (SSP) which is (at the time of writing) £75.40 a week. Your employer will pay it to you in the same way as they pay your wages. You may be entitled to more depending on whether your employer has an Occupational Sick Pay scheme or not. Not all employers do. Make sure your employer gets your sick notes and that there are no gaps in the notes. If you can keep copies of the notes for yourself (i used to scan mine onto the PC as I couldn’t get out to photocopy them). And I’d recommend speaking to HR if yoe are able to and esepcially if you’re unsure about your wages situation. They should be able to explain it to you. I hope you make a good recovery. as i was having a medical examination on the 28 july, my DR.
I’m not an expert by my understanding is the same as your employers. If the note says to refrain from work until 29th that indicates to me that you should be refraining up to and including the 29th. I can see how you could interpret it both ways. Sounds like you need to ask your doctor to give you a return to work not which clearly states you should be working on the 29th. But it might be a bit late as it is already the 29th? Hope this isn’t a huge problem in terms of pay and sick days for you. I am just emailing you to see if you can give me some advise on a situation I find myself in.. I have been at my job for 9 months now and last month I broke my foot which meant I had some time off work, I went to doctors and got a sick note from him for a week which ran out on the 16th June 2008, I went back to him on the 13th June to get another as my foot was still bad and he gave me another one for 2 weeks which he was supposed to do from the 17th June so it would run on from the previous note. Any advice would be great, I need to know if i have a good case at all to take them to tribunal?? Ben – you would need some expert advice on this. Maybe Citizens Advice could point you in the right direction. I have been with my current employer since 5th March 2007 when i started my colleges and i were told we get 6 months full sick pay and six months half, it did not state this anywhere in our contract all it said in the contract was the company runs an occupational sick pay scheme for more information contact HR. I got made permanant in September 2007 when my sick pay would have begin to start as i was not entitled to any sick pay in the forst 6 months probation period. I found out i am pregnant in January 2008 and told my employer in February 2008. Unfortunatly i suffered with sickness and had to have 4 weeks off work due to being in hospital i recieved full sick pay for this, but when i returned to work they turned around to me and said you are not entitled to anymore sick pay. I followed this up with information i found saying they were not allowed to do this and they agreed i would continue to get full sick pay but they were looking into changing the sick pay scheme for the whole company. In June i had to have a further 5 weeks off due to a pregnancy related illness and when i returned to work the new revised contract had came out. My contract states that it had been backdated to 1st April 2008. Once you have achieved 12 months service, you will be entitled up to 3 months at full pay and 3 months at half pay in a rolling 12 month period. Now to me that means from 1st April 2008 i am entitled to 3 months full pay and 3 months half pay but with me being off work again due to pregnancy related illness i have now been told that they are taking it from August 2007 so i will now be on half pay. i have been forced off work with stress due to situation at work, since being of work with a valid doctors certificate my company has in formed me that they are stopping my csp due to the fact that i have not followed company notification procedure. how ever i have followed procedure and have documented it as well. can they do this? What a horrible situation to be in. I’m sorry I’m not an expert but sounds like you need to seek some professional advice. If you are a member of a union seek their help now. If not perhaps try with citizens advice who may be able to help advie or at least point you in the right direction. Hi, I have been off work recently and been to GP a couple of times and have been given sicknotes for 2 weeks at a time. That is easy to work out when I should have returned to work. I have now been given a note dated 2nd December for 1/12 so when would I return to work? Best thing would be to ring your GP and clarify. Also check whether you need a return to work note – basically a diffeent note that officially signs you back on. Best to double check now than get into bother later. It’s very confusing isn’t it? This is my sixth day being off of work with a really badly strained back. my doctors surgery is really far away. i do not drive and could not bare public transport all the way there with my back the way it is, i can barely stand. my employer has requested that if i am off tomorow will need a doctors note. does this mean that if i get to my doctors at some point over the weekend, that my doctor will backdate it for me? i am confused as to how he could sign for something he has not seen? Hi Nico. Your doctor can backdate a sick note provided they are willing to give you a note for it. If you have a history of back problems you *may* be able to speak to a GP from your surgery over the phone and they *may* write a note on the strength of that telephone consultation. BUT I don’t know that all GP surgeries will do this and they’re not obliged to do it this way. Give your surgery a ring and explain the difficulty with coming to see the GP just to get the note and see what they advise. Some doctors only run emergency surgeries over the weekend so you may not be able to see a GP about this over the weekend. Best phone and see what they advise. You will need the note to cover you over the weekend too. Even if you don’t normally work weekends the period of sickness will be counted until the day you return to work. The doctor will understand that though. And I hope your back gets better. Good luck with it all. Hi everyone, i am currently on my second day off sick, i went to the doctors with back and rib and he told me that i have trapped a nerve in my pelvis. i have been referred for a spinal examination at Hospital, as the doctor says he thinks i may have a curve in my spine too. I am in alot of pain, but my doctor didn’t mention anything about giving me a sick note, and my employer is now basically harassing me and saying i have to come into work as theres no one to do his work! would i be able to get a sick note from my GP without having to go back to the Drs, as i can’t drive to get there? What do you think i should do? Hi if i have had a major operation would i be entiltle to sick pay, i had 3 months off work and was not paid and i believe my employer owes me £3000. Clare – Ring your surgery and ask. As the doctor has examined you he may be willing to write a note without seeing you again. But you’ll probably need someone to pick it up for you. Judith – You may be entitled to Statutory Sick Pay if you have enough National Insurance Contributions. Might be a good idea to seek some advice from the Citizen’s Advice Bureau. If you are a member of a union at work they will also be able to offer you some advice.